Internet Explorer's default behavior is to display pictures whenever they are part of a web page (as long as the corresponding image files are on the web server). This makes for a richer internet surfing experience, but can sometimes be a drag when either your internet connection is slow, or when the web server in question (the online computer where the website is hosted) is itself slow. One easy way to speed up your internet connectivity with Internet Explorer is simply to (temporarily) disable and hide pictures from web pages. Follow these simple steps to disable and hide images in Internet Explorer, a setting that can be turned on or off at will - nothing final here. first, if needed, launch Internet Explorer. Once you are in, click on the Tools menu, and choose "Internet Options" - if you do not see a Tools menu, just press Alt+T on your keyboard, and the Tools menu will drop down, regardless of what version of the web browser you have installed on your computer: Internet Explorer 8, IE 7, or IE 6. You will find a box labeled "Settings", which includes all the advanced options you can customize for Internet Explorer. Scroll down a bit further than halfway through, and you will see a subsection called "Multimedia", which contains a "Show pictures" checkbox that is checked by default. To prevent Internet Explorer from loading pictures of all kinds on web pages (photos or clipart images, etc. ), just uncheck the "Show pictures" checkbox, and click on the "OK" button to apply your new setting and return to your browsing. Depending on which version of Internet Explorer you are using, you may need to refresh the current page to see the change (press F5 on your keyboard). As soon as the new option is applied, you will see web pages as usual, as far as text and styling are concerned, but you will see empty placeholders where images are supposed to be: here's a screenshot of this tutorial with images disabled in Internet Explorer - you can tell that pictures are in fact hidden! ...And this is all it takes to disable and hide images for web pages in Internet Explorer 8, 7, or IE 6. 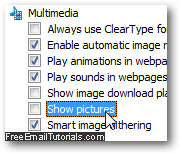 Should you decide later on to restore showing pictures, no problem: just follow the same steps, but this time do check the "Show pictures" checkbox before clicking "OK" to change your multimedia settings (and reload the page with F5 to see the images reappear).